Please note that on Friday September 7, 2012 thru Sunday September 9, 2012, 3rd Place between Court and Smith Streets will be closed due to placement of crane on roadway for hoisting materials from the subway structure above to street level below through Saturday day. The crane will be dismantled, concrete pump truck set to pour new track on the structure above. The work hours will be 10pm on Friday until 11am on Sunday. In addition we will have signs posted to inform of the street closing. completely captured by the financial industry. It would have been rough on New York, but much better for the US as a whole. The below update on the massive sinkhole in Bay Ridge comes from NYC DEP. Just a thought, but with millions out of work, record low borrowing costs and crumbling infrastructure in water, sewer, transportation, electric and other categories around the country … maybe we could spend some money on infrastructure? Or you know, just bail out the banks again. DEP contractors have stabilized the sinkhole and have excavated approximately 63 feet below the roadway to expose the damaged sewer line. Crews have removed the top portion of the collapsed sewer section and are making preparations for its reconstruction. Two 24-inch bypass lines were installed to divert wastewater flow past the compromised portion of the line. The bypass lines are being continuously monitored to ensure their operational integrity. Repair work should be completed within the next two months. On June 28th, DEP was notified that a sinkhole had developed over an 11-foot diameter sewer tunnel on 92ndStreet between 3rd Avenue and Ridge Boulevard in Bay Ridge, Brooklyn. The sewer was built in 1902, and carries 15 to 28 million gallons of wastewater to the Owls Head wastewater treatment plant on a normal dry weather day. Responding crews discovered a 30' x 30' void underneath the roadway pavement. The undermining was caused by a partial collapse of the sewer line that runs under 92nd Street at a depth of roughly 70 feet. All area residents have full utility services (water, sewer, gas and electric) with no related disruption. Street parking restrictions have been lifted with the exception of the immediate work area. All streets adjacent to 3rd and 4th Avenues are open to traffic. Buildings adjacent to the work site are being monitored for any vibrations and settlement during all construction operations. DEP will continue to provide the community with regular updates. A reminder to be alert to your surroundings when walking home at night. mugged there just the same. This is a pretty cool tool - a wealth of information to be visualized citywide. As always I'm struck by how much parts of NJ fit with NYC - but due to political boundaries, we don't do regional planning as well as we should. The Port Authority is a decent model (never mind that 90 years on it's founding purpose of a Cross-Harbor Freight Tunnel remains a dream). Perhaps down the road we will see more coordination between the states, or even a shuffling of portfolios among authorities. All right, I've now wandered way off topic. Go check out that map. "The Citi Bank–sponsored bike share program that was supposed to launch last month won't arrive until next spring." Disappointing. But better to wait than to roll out a debacle. It's official: The Citi Bank–sponsored bike share program that was supposed to launch last month won't arrive until next spring. "Hopefully the software will work by then," Mayor Bloomberg said on his radio show today. 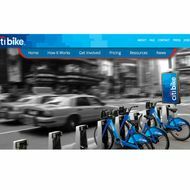 Software was blamed for a delay on July 31 as well, when the Citi Bike program was to launch the first 1,000 of 10,000 shiny blue rides. At the time of that delay, a Department of Transportation spokesperson insisted that the program was still planned for 2012. "The software doesn't work. Until it works, we're not going to put it out," Bloomberg said. "We did think there would be a possibility we would have bikes on the streets this summer. We think ... this spring." At a Coney Island press conference yesterday, Bloomberg insisted that there's no "secret agenda" with the delay. "The software doesn't work. And putting it out when the software doesn't work, it wouldn't work. Period." He added that the delay isn't costing the city any money. "The city loses because we don't have bicycles, but the city doesn't lose any money," he said. as well as the MTA's NY catchment area. done on a regional basis. No easy task, but worth focusing on. Hard to believe this was just a giant hole in the ground not long ago. Or a LICH facility just a few years back. Maybe that never existed in fact, but at least we had stated ideals. We've fallen far in the last 12 years. Uh oh. This is troubling, but if we make the cover of TIME, all is lost. Ayn Rand (born Alisa Rosenbaum) was an all around awful human being. And the people who fetishize her and her objectionable Objectivist philosophy (cough Paul Ryan cough cough Alan Greenspan) are at their cores truly horrible people. But all that said, even I was not prepared to learn the depths of her depraved thinking. Yves here. There is one way that Mark Ames' underlying post needs a smidge of updating. Sadly, the technocratic elites in Europe are now firmly trying to inflict bone-crushing austerity on ordinary workers, despite visible evidence of its failure (debt to GDP ratios keep rising as the economies contract) and widespread public opposition. There the rationale is a bizarre combination of "punish the borrowers" when countries like Ireland and Spain were held up as poster children of economic success until the bust, and a need to hide the fact that what looks like rescues of the PIIGS is in fact bailouts of French and German banks. To celebrate today's announcement that Ayn Rand fanboy Paul Ryan will in a few months' time be a heartbeat from the presidency—and to honor this special moment, marking the final syphilitic pus-spasms of America's decline and fall–we are reposting for your edification Mark Ames' 2010 article about the man behind the Rand: Ayn Rand's unrequited adoration of a notorious serial killer, William Edward Hickman. Yes, Vice President-to-be Paul Ryan owes his entire "moral" worldview to a lowly groupie of serial killers, a 1920′s prototype of today's "Joker" wannabees. Yes folks, in a few months' time Americans will finally be able to stand up and declare: "We are all serial-killer groupies now." There's something deeply unsettling about living in a country where millions of people go frothing batshit angry at the suggestion that maybe health care coverage should be extended to the tens of millions of Americans who don't have it; or when they froth at the mouth in ecstasy at the thought of privatizing and slashing bedrock social programs like Social Security or Medicare. It might not be as hard to stomach if other Western countries also had a large, vocal chunk of their population who thought like this, but the US is seemingly the only place where right-wing elites can openly share their distaste for the working poor. Where do they find their philosophical justification for this kind of attitude? 200 million tons of sand excavated from LI to build NYC buildings and infrastructure. That's a lot of scratch. The previous post reminded me of a site I've meant to post about literally for years now, ever since first reading about it in Michael Welland's book Sand. [Images: Sand mines, via Michael Welland's excellent blog Through the Sandglass]. "In 1865," we read, "mining began on the northern shore of Long Island to collect sand washed out from retreating ice age glaciers." As the New York Times reported back in 2008, a "monument honoring the sand mining industry" has since been erected in Port Washington, from whence more than 140 million tons of sand were excavated. There is still one open tunnel there, as well as "the remains of a conveyor," in the landscape—which has since been turned into a golf course. Historic photos of the site in its sand-mining heyday are pretty incredible. block over the past couple of years were as discerning. radar, like Malcolm Gladwell. Or Adam Davidson. peds and cyclists on the bridge. spot-zoned for denser residential in a far less contextual location. increase in completed Brooklyn Bridge Park space next season.